There are 32 adult teeth (including wisdom teeth) and 20 baby teeth in humans. Missing teeth means an abnormal reduction in the number of teeth we are suppose to have. Baby teeth that are naturally missing often indicates that the corresponding adult tooth will also be missing. Sometime a missing tooth is not missing but just stuck and impacted under the gums. This can result in baby teeth still staying on longer than it should. Missing teeth can cause an unnatural drifting of neighbouring and opposing teeth. This happens slowly and painlessly but eats away the space that was meant for the missing tooth. As a result, teeth gaps start to appear and midlines drift over time. Left untreated, the bone around the missing tooth shrinks and disappears. 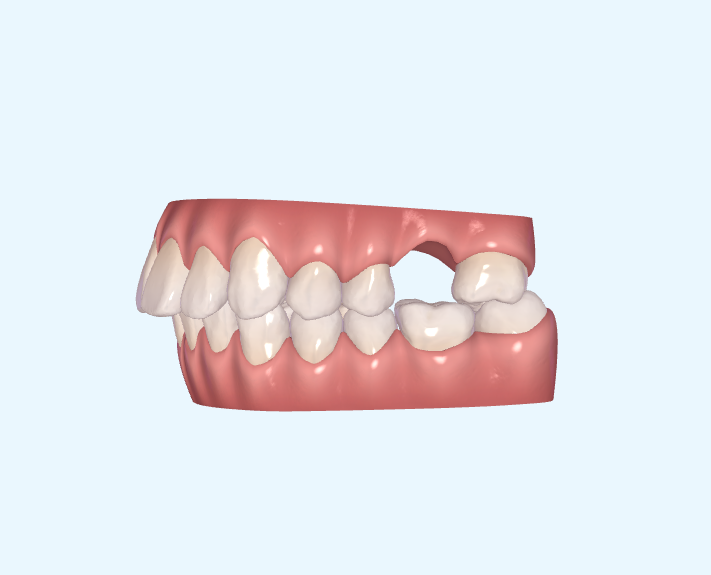 Replacement of the missing tooth gets increasingly difficult as other teeth shift into its space and bone is lost. At MyBracesClinic, we evaulate the whole smile and bite to see if Tooth Replacement Therapy is an alternative to artificial tooth replacement. With Tooth Replacement Therapy, we avoid a lifelong artificial tooth replacement such as an implant, bridge or denture; and enjoy natural, healthy and straight teeth. That’s a win-win situation!